2) CINCINNATI MANUAL VERTICAL MILLING MACHINERS. SUNNEN MBB 1290D HONING MACHINE. OVER 20 LISTA CABINETS, WOOD TALBE TOP CABINETS, LISTA SHELVING. LARGE SELECTION OF KURT VISES. LARGE SELECTION OF CT-50 TOOL HOLDERS, CUTTING TOOLS, END MILLS, COLLETS, CARBIDE INSERTS, BORING BARS, BRIDGEPORT SINE PLATES, TOOLING, AND SUPPORT. LARGE SELECTION OF INSPECTION TOOLS, GAGES, MICS, HEIGHT GAGES, GRANITE PLATES SUNNEN HONE PG-800S GAGE, CF-502 AND CF 1126 GAGE SETTING FIXTURE. 2015 HYDROVANE HVFR2B 25 HP ROTARY AIR COMPRESSOR WITH BUILT IN DRYER AND EXTERNAL TANK, S/N D135309. CAT ELECTRIC FORKLIFT, 3000 LB CAPACITY, MODEL 2EC30. LE BLOND TAPE TURN REGAL 24 CNC FLAT BED LATHE WITHH GE CENTURY CONTROL, 16’’ CHUCK, 2.5’’ THRU HOLE, 6FT CENTERS. 1985 CINCINNATI MILACRON MONOSET TOOL AND CUTTER GRINDER, TOOLED, S/N 4898A0185-0043. 1997 OKUMA LB 45 II CNC LATHE WITH 2 AXIS, SOP 7000L CONTROL, 15’’ CHUCK, 3.5’’ THRU HOLE, 12 STATION TURRET, TAIL STOCK, CHIC CONVEYOR, S/N 1042.0225. OKUMA LC-40 CNC LATHE WITH 2 AXIS, OSP 5000L-G CONTROL, 12 POSITION TURRET, 15’’ CHUCK, CHIP CONVEYOR, S/N 01071856. OKUMA LB-25 CNC LATHE WITH 2 AXIS, OSP 5020 CONTROL, 12’’ CHUCK, 12 POSITION TURRET, TAIL STOCK, CHIP CONVEYOR, S/N 07021489. 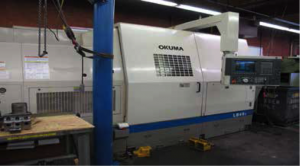 OKUMA LB-15 CNC LATHE WITH 2 AXIS, OSP 5000L-G CONTROL, 12 POS TURRET, TAIL STOCK, 10’’ CHUCK, CHIP CONVEYOR, S/N 6201.4348. OKUMA LB-15 CNC LATHE WITH 2 AXIS, OSP 5000L-G CONTROL, 12 POS TURRET, TAIL STOCK, 8’’ CHUCK, CHIP CONVEYOR, S/N 6201.3249. 41.3’’ X 23.6’’ X 22’’ (XYZ), 3500 RPM, S/N LM-163. 41.3 X 23.6’’ X 22’’ (XYZ), 3500 RPM, S/N LM-043. MAKINO 12’’ 4TH AXIS ROTARY TABLE, WITH TAIL STOCK, S/N 466. MITUTOYO MODEL KN 815 CMM, WITH RENISHAW PH10-M PROBE, 850mm X 1500 mm X 600 mm (XYZ), AND VIRTUAL DMIS SOFTWARE. 1980 YASDA YBM-80N CNC HMC, WITH FANUC 7M CONTROL, CT-50, 50 ATC, 24 X 24 PALLETS, 1 DEGREE INDEX, S/N 7031641.